I love all things crunchy!! Especially all things crunchy of the salt and vinegar variety! I was recently contacted to review this neat little chip from RW Garcia, called Tortatos. What makes this different from your "average chip?" Well, this chip is a delectable combination of red potato and corn in one delightful little chip! 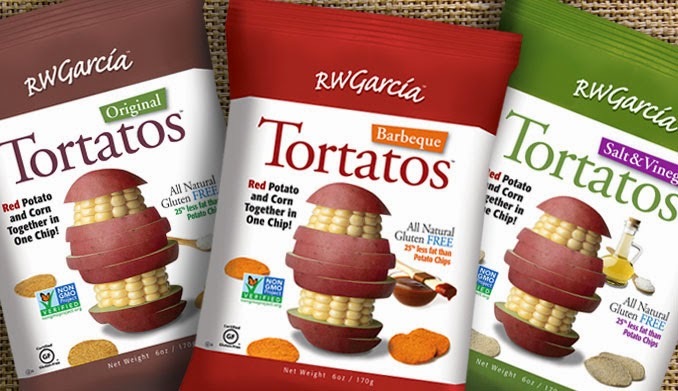 RW Garcia Tortatos™ taste a lot like potato chips and a little like tortilla chips. They’re fantastic with the dips you dunk tortilla chips into, superb with dips you dunk potato chips into, and delicious crunching compulsively right out of the bag. Available in four delicious varieties, Tortatos are made with all natural ingredients, and have 25% less fat than traditional potato chips. Non-GMO, Trans fat free and gluten free certified. The Tortatos are really wonderful!They are thick and sturdy enough to be used as a chip to dip, but tasty enough to be eaten alone! As you might have guessed, the salt and vinegar is by far my favorite!! I was lucky enough to receive the Original, Salt and Pepper, Salt and Vinegar and Barbeque! This selection means there is a chip that anyone can love!! It is hard to exactly describe the Tortatos. To me, they taste a little more like a corn chip, but I think that is mainly because they are a little thicker and a little less greasy than a traditional potato chip! Whichever they taste like, they are downright delicious and I will be scouring the shelves of my local Target, looking for more!